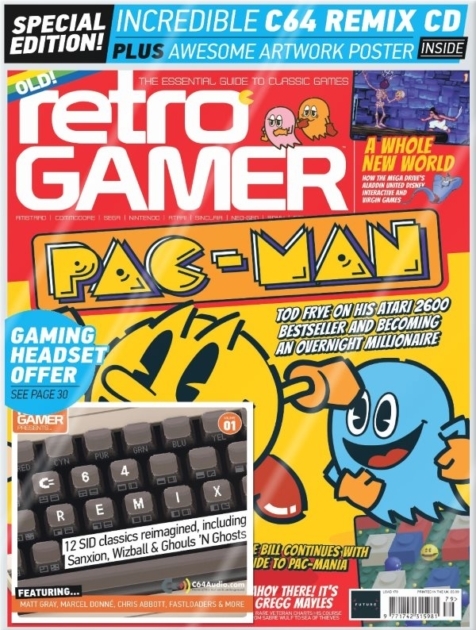 Issue 179 of Retro Gamer is rolling into newsagents, with two fantastic gifts that will please any fan of the Commodore 64. The C64 Remix CD features 12 classic tunes reimagined from their original SID incarnations, with the likes of Matt Gray, Marcel Donné and Chris Abbott remixing Rob Hubbard, Martin Galway and more – see the bottom of this post for the full track list. There’s also a double-sided poster, featuring a nostalgic Commodore 64 scene on one side and a selection of fantastic artwork from the late Bob Wakelin on the other. Inside the magazine, you’ll find two great features on Pac-Man. In the first, Tod Frye talks about his Atari 2600 conversion of the classic arcade game, and the highs and lows that came with it. In the second, we delve into the late-Eighties arcade sequel Pac-Mania and all of its home conversions in an Ultimate Guide. Elsewhere in the magazine, you’ll find the making of home computer hits Dark Star and Moonstone as well as the hit Disney licensed platformer Aladdin. Additionally, there’s a collector’s guide to Quicksilva games, a look at the BBC Micro’s excellent arcade clones and a Minority Report on import Dreamcast games. You’ll also find an Ultimate Guide to Konami’s lighthearted shoot-’em-up Parodius, a history of Sonic The Hedgehog’s outings on the Master System. As always the issue is capped off with a sit-down interview, with this month’s subject being Gregg Mayles – a veteran game designer at Rare whose work includes Battletoads, Donkey Kong Country, Banjo-Kazooie, Viva Pinata and the current hot Xbox One game Sea Of Thieves. Of course, that’s not all – as always, plenty more games are featured in Retro Revivals, The Unconverted, Classic Moments, Lost In Translation and Back To The Noughties. You can find the magazine at all good newsagents from Thursday 22 April 2018, or order online via My Favourite Magazines. If you prefer a digital copy, you can find it via the Apple App Store, Google Play, Zinio, Pocketmags or Readly.